We are stockists of Aluminium Round Bar in a wide variety of sizes, all of which are ready for quick despatch at some of the most competitive prices on the internet. Solid Aluminium Round Bar is an extruded cylindrical section, which we supply in grade 6082T6 (formerly known as H30 TF). Grade 6082T6 is a relatively hard grade of aluminium, which makes these Aluminium Rods ideal for turning, milling, CNC machining and drilling. On the shelf, we have a great range of Round Aluminium Bars in imperial sizes. 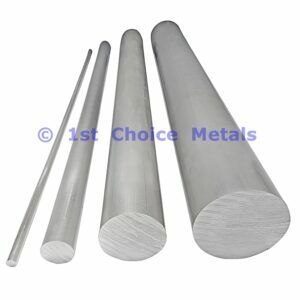 We can also supply metric Aluminium Round Bars upon request – please contact us for a price. 3/16” diameter 1” dia 2.1/8” dia. 5” dia. ¼” dia. 1.1/8” dia 2.1/4” dia. 5.1/2” dia. 5/16” dia. 1.1/4” dia. 2.1/2” dia. 6” dia. 3/8” dia. 1.3/8” dia. 3” dia. 7” dia. ½” dia. 1.1/2” dia. 3.1/4” dia. 8” dia. 5/8” dia. 1.5/8” dia. 3.1/2” dia. ¾” dia. 1.3/4” dia. 4” dia. 7/8” dia. 2” dia. 4.1/2” dia. Each of the above sizes of Aluminium Bar can be supplied in any length as required from 10mm long, up to 3 metres long. You can select the nearest offered length from the dropdown menu and use our Free Cutting Service to receive your Aluminium Round Bar cut to a precise size. Alternatively you can select a longer length of Aluminium Round Bar and use the cut to size tool, to request that we supply it cut into several smaller billets or blanks, ready for you to work on. As well as having good machinability, Grade 6082 Round Aluminium Bars are also excellent for welding, they have excellent corrosion resistance and high strength properties, making them a great all round general engineering and structural aluminium product. Aluminium Round Bars are commonly used in the manufacture of parts and components for machines, cars and bikes – items such as foot rests / foot pegs, stands, spacers, shafts, mountings & rings. We can supply Aluminium Round Bars cut to size, delivered quickly to anywhere in the UK & throughout the EU. To check shipping rates to your location (within the UK), once you have selected the items(s) that you require, click to go into your shopping cart. Towards the bottom of the page you will see a section entitled “Basket Totals”. Just beneath this you will find some text that reads “Calculate Shipping” – simply click on this text and enter your full postcode where prompted – this will then give you an accurate price to ship the items that are in your basket, based on the total package length, weight and your delivery location. We do not currently have shipping rates set up for locations outside of the UK, therefore should you require your Aluminium Round Bar delivered to countries such as France, Republic of Ireland, Italy, Germany, Denmark, Spain, Sweden etc then please contact us for a shipping cost.